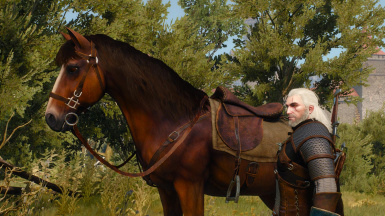 Point 1, if your horse goes over a small bridge (Example Kaer Morhen's bridge) your horse stops as if it was hit by a brick wall. Point 2, if there is a small rock here or there your horse just stops in his tracks. Really frustrating if your horse racing and that happens then you lose and have to do it again. If anyone else has any other problems with horses let me know. Be happy Shadow, I heard you! I share the same feeling, and so I made this mod as an attempt to fix that. As a result, Roach is now UNSTOPPABLE, even if you jump from a cliff or go into water. Watch the videos to see a good example. Use NMM or unzip the file in the Mods directory. Don't forget to use Script Merger to prevent any conflict!